This is a chocolate cake recipe. But this is not your boring, generic, dry, chocolate cake recipe. This is THE chocolate cake recipe. It’s the one you’ll want to use for birthday cakes, bake-offs, bribes, and Sundays (…Because, Sunday.). And even though this cake is more than delicious enough completely by itself; we’re going to turn it into a layer cake, and coat it with an incredible Whipped Cocoa Buttercream frosting. Every time someone uses the word ‘moist’, the internet tends to explode. Well, okay. Maybe not the entire internet, but there is a pretty large faction that just hates the word ‘moist’! As a food blogger, this makes my life very hard. How else am I supposed to describe this deliciously decadent, fantastically fluffy, and marvellously mousse-like chocolate cake to you? I can tell you repeatedly that it’s “not dry, but also not underbaked and wet; it’s just that right kinda consistency”, but that doesn’t seem quite succinct enough. So, it’s moist. Incredibly MOIST. So moist that if the gratuitous use of the word “moist” makes you uncomfortable, you should’ve probably sat down before reading this post. Also, I made this for someone’s birthday recently. She liked it a lot. She said that it’s one of the best cakes she’s ever had. And she loved the frosting too. I’m not being biased or anything but, you should take her word for it. 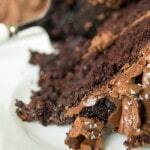 This is a wonderful chocolate cake recipe, the frosting is yummy (and I’m not usually even a big fan of frosting! ), and you should make it this weekend. It’ll only take you an hour or so. And finally, as the more astute of you may have noticed – I’ve changed my recipe plugin. I’m now using the fantastic Yummly Recipe Plugin – it’s one of many behind-the-scenes improvements I’ve been working on! For those of you that use Yummly, please do click the Yum button to save this recipe to your Recipe Box. Of course, you can find my recipes through my Yummly Profile as well. What do you think of the Yummly recipe plugin? Or the chocolate cake? Or the frosting? Or the weather? 🙂 Let me know in the comments! 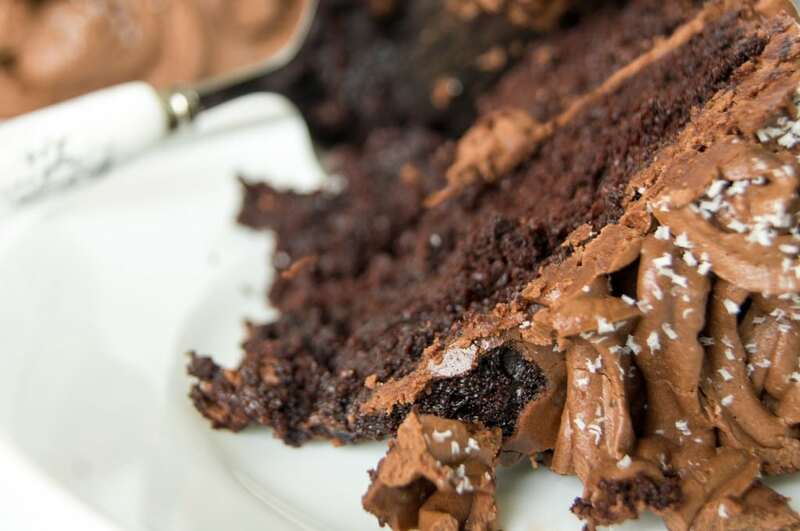 A delicious and easy recipe for a Two-Layer Chocolate Cake with a Whipped Cocoa Buttercream. Perfect for birthday cakes! Preheat oven to 350 degrees F. Grease 2 8-inch round cake pans – ideally, spring-form pans. Line with parchment paper, then butter. Combine flour, sugar, baking soda, baking powder, cocoa powder, and salt. In a separate bowl, beat together eggs, buttermilk, Greek yoghurt, canola oil, and vanilla extract until smooth. Add dry ingredients to the wet mixture in parts with the mixer on low until completely incorporated. Pour in the hot coffee, mix until combined. Fold in the chocolate chips. Pour the batter among the 2 cake pans and bake. About 30-35 minutes, until the tops are just set. Let the cakes cool for a few minutes, before removing from the cake tins. Allow the cakes to cool completely before frosting. Cream together butter and icing sugar. Add cocoa powder and vanilla extract and continue to beat until completely incorporated. Add the whipping cream and whip the frosting mixture until light and fluffy. Add more icing sugar if you prefer a sweeter or thicker frosting. Place a layer, flat side up. Spread frosting on top. Place the second layer on top of the first layer, flat side down, and spread frosting on the top and sides of the cake. If you’re planning to do anything fancier than a flat frosted cake, I’d highly recommend a crumb coat. I used a handheld mixer. Feel free to use a stand mixer, or do it the old-fashioned way… with a big spatula! Hi, can you please let me know if it 1 x 1/2 a cup of flour or 1 and 1/2 cups of flour. Many thanks. The weather isn’t so bad at the moment, it’s dry and warm and occasionally sunny. Well you did ask. 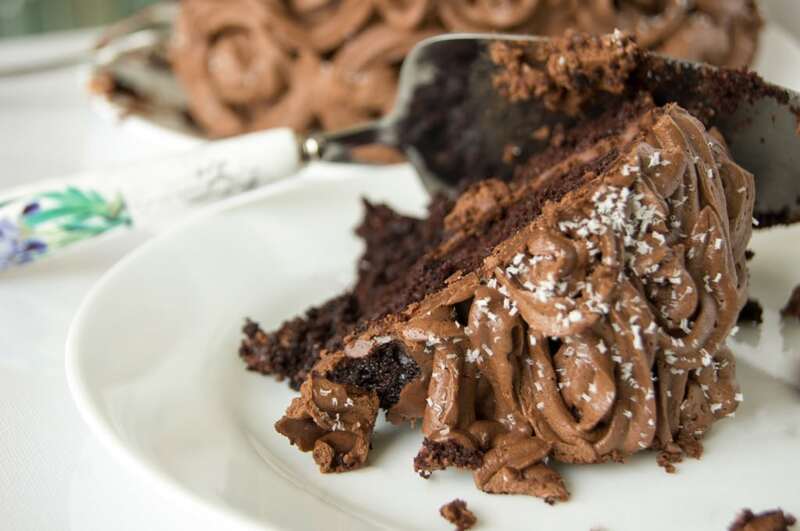 The cake looks great and I don’t understand why some people have a problem with moist – it’s a great way to describe a cake, because to be honest, my worry when I see a chocolate cake is that it will be DRY – yuck! I didn’t know Yummly had a recipe plugin – it looks good. I’m going to yum this one right now. That looks gorgeous! I am not a great baker but I’ll pop back if I ever do need to make a cake (it happens!). 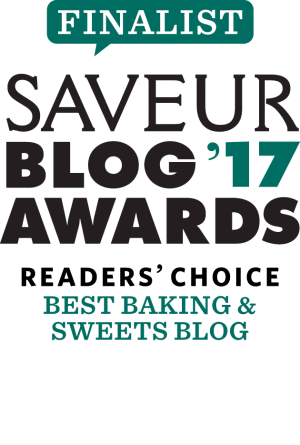 And do let me know how you get on with the yummly plug-in – it’s not the one I am using but I did spot it and it seems to have some great features. So far the the Yummly plugin has been pretty easy to use. I love that it has a built in option to create sections within your recipe ingredients. That makes everything SO much clearer! Nothing worse than a dry chocolate cake! Yours looks divine! yummed. This looks great and definitely moist. How else would you describe a delicious looking cake like yours? Haha no idea! Hence… Moist! Thanks Sarah! I’m usually not a fan of frosting but I definitely loved the frosting on this one! I have never wanted chocolate at 10.39 am before! Nice recipe thanks for sharing I will be book marking this little one! Thanks! I hope you use it often! A rich dark chocolate cake, covered in a silky mocha swiss meringue buttercream, drizzled with a dreamy chocolate ganache. Wow looks so yumm yumm… i am a big chocalate fan. Just wanna know can i use normal yoghurt with this receipe indtead of greek youghurt. Lovely cake! It looks “moist” and delicious! Yeah, how else would you describe a cake? I love to use Greek yoghurt in my baking too. Thanks for sharing! Thank you for commenting Vicky! 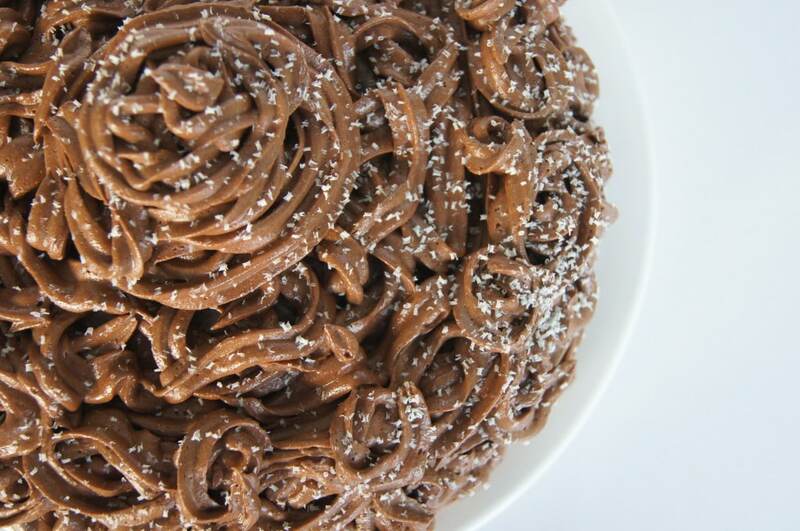 Hey can I use this recipe to make a chocolaye cake at home and as a base recipe for business ? Hey Earl! Yes, as long as you’re NOT republishing the recipe, it should be fine 🙂 If you’re using social media, please do tag/credit me whenever you make or share photos of the cake! If you want to provide more information, please feel free to email me at [email protected] . May I use or try this Two-Layer Chocolate cake with Whipped Cocoa Buttercream recipe at home and as a base recipe or foundation recipe when I open my own bakeshop in the future ?